There is nothing better in this world then a big, fat, bloody and juicy steak. I mean, honestly, if my steak isn’t bloody, I don’t even care to have it, but this has me grossed out beyond repair. Now, if you aren’t a big fan of a bloody steak and I guess in some cases even if you are – it already looks pretty gross. Of course, most of us are imagining it to be the blood from a cow, because that’s what it is, right? That liquid leaking from your steak, and covering your counters in a yucky puddle is protein that is used in the cow’s body in order to deliver the oxygen from the cows lungs to its muscles. 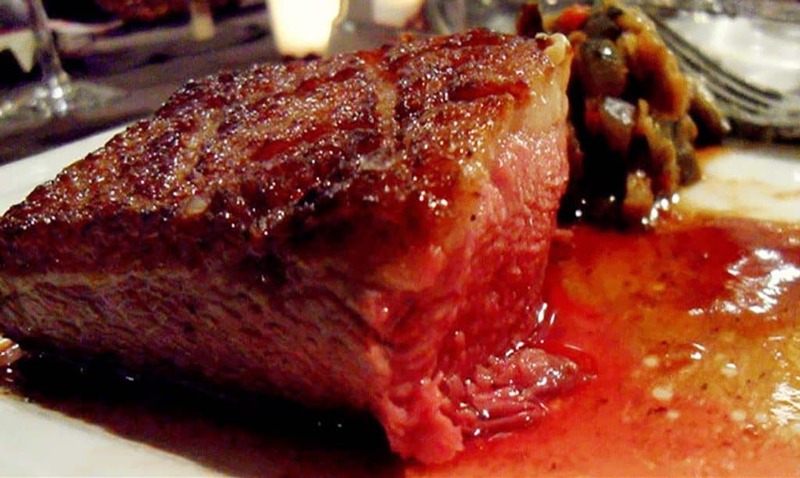 However, when the meat is cut into, exposing the myoglobin to air, it turns into a rich red color that resembles blood. Meat is composed of 5% fat/carbs/minerals, 20% protein and 75% water. When meat is frozen, the water crystalizes into ice. And when the ice melts it then carries the myoglobin, which has iron with it during its transport to the muscle. And as the meat is cooked, the redness begins to turn into a much darker color, turning the meat to a gray color when fully cooked. To add to the red color, butchers add carbon monoxide to the meat, which gives it an even brighter redness, which makes it look fresh. Of course, I don’t really care what color the liquid is that runs out of the meat as long as the flavor stays the same. And I mean, who cares if its blood or protein- it doesn’t change anything, so as far as I am concerned, pass the steak!